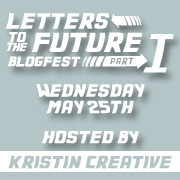 Kristin Creative: Letters to the Future Blogfest! Today is the day! To celebrate my blog reaching 300 lovely followers and lurkers, I'm hosting my first blogfest, Letters to the Future! The idea is to write a letter to our future selves to look back on one day. If I can remember, I'd like to read mine again a year from now and see how things have changed. Then perhaps a Letters to the Future Blogfest Part II??? As you're writing this, it's Tuesday, May 24th, 2011. There's a lot of buzz about the end of the world and how it did NOT happen May 21st, as predicted by some crazy old man who apparently hasn't read the very clear verse in the Bible that says "But about that day or hour no one knows, not even the angels in heaven, nor the Son, but only the Father. "- Matthew 24:36. Why he's bent on throwing a portion of the masses into hysteria, I don't know. Sad. But aside from that, you've been thinking about death lately, since your HS friend Dennis' dad passed away last week. You're reminded again how important it is to let your loved ones know how you feel, to have more of a positive attitude on a daily basis, and to take control of your health once and for all. Your ten year high school reunion is this year, and it's your job (along with the other two girls from your class) to figure out what to do about it. This has got you thinking a lot about how quickly time passes, and you've realized that nearly all your friends have children already, and you don't. But you still feel like you're getting used to being an adult with a husband, a house, your own photography business (which is SLOW GOING), and two dogs, so you'll think about it later. You just joined Twitter last week. It's insane, just like you. Well, that's pretty much you at this exact moment in time on this Tuesday in May. Oh, and your right foot is asleep. Please visit the other participating blogs and show them some love! Your letter was wonderful. What is it about us women and our flipping weight. I am the same way, except I haven't gotten my lazy but up to do anything about it as of yet...my future self is probably better than my college self. I can dream! Good luck on that 10 year reunion, mine was fun and I reallized then that everyone had the same insecurities going to it as I did. Hard to believe I'll be coming up in the 15 next year. Yikes. How funny is it (or not so funny) that during the time we're writing our future letters there were people thinking about the end of the world. I love all the added info you added here. I can't wait to hear the future you announce the title of Pippa's story. I love Italy so any book that mentions it would be fabulous, seeing as I'm not sure if I'll ever be able to visit. Fabulous blog fest! I had a ton of fun! I loved this blogfest, Kristin, such a great idea! I am so glad you like Doctor Who! It's great! This was a good exercise. It reminded me of what is important to me. Loved your initial comment about the false-prophet guy and the end of the world. You'd think that Bible verse was pretty clear, but... sigh. You're right, it is sad. Thanks for doing this, Kristin! I had a great time writing my letter. :) And good luck on your Italy book. I'd love to go to Italy someday!! Love this blogfest! And, yeah, I totally need to watch Castle. Everybody who watches it has said I'd love it. COME ON, NETFLIX!! Got mine! :) Loved reading yours, it made me laugh. Great letter. Good luck with your reunion (mine is probably sometime soon), and I would be SO cranky without meat and dairy!